Hello Briar Press friends. This cut looks like an ATF item from the identification numbers, but I haven’t been able to find in in any of the ATF catalogs available to me (which is to say, any of the catalogs available on archive.org). Has any of you seen it? If so what can you tell me about it? Thanks! EDIT: I should have mentioned that these are three separate full-type-metal castings. There is a pin mark on the side: a circle with “AMERICAN 60”. I tried looking this up in all the ATF and BB&S specimens I have and couldn’t find a match. There’s something about the image (roof and cut off trees) that makes me wonder if there is a fourth block missing. Do you think that might be possible? Thanks for looking. I tried all the ATF catalogs on archive.org (from about 1893 onward), and didn’t see any three-color cuts let alone this one. I also looked at the BB&S No. 9 and No. 25-A. It’s certainly possible that there’s a fourth color, but when I bought them they were neatly and securely taped together. I got the impression that they had been stored as a set for a long time. Now’s when I wish I kept better records for purchases like this. I ran a quick one-color proof to see the print quality. I should do a three-color proof to see how they fit together. I think the pine trees in the center stick up above the border but the ones on the left stop at the border. I think the space between the structures and the trees is supposed to look like snow on the roofs??? These cuts are shown in an ATF special Christmas cut catalog from the 1930s. I have posted it on my Flickr site. The page that shows those cuts has two-sizes of it and there was a fourth color (outline), which I have in my set. These cuts are shown in an ATF special Holiday cut catalog from the 1930s. I have posted it on my Flickr site. The page that shows those cuts has two-sizes of it and there was a fourth color (outline), which I have in my set. Your missing piece should be No. 813. Printing multiple-color cuts and engravings has become one of the things I enjoy most about printing. As a teenager in my dad’s job printing shop, I didn’t have much occasion to indulge in this kind of work, but now that I have taken up letterpress printing again as a hobby, I have had the opportunity to dabble in it. It can be challenging, however, buying cuts and engravings to achieve these two-, three, four- and more color effects. Last summer I purchased on ebay two large engravings (about 75x 20 picas) of Santa Claus being pulled in his sleigh by his reindeer. The two engravings appeared to be (and were) in excellent condition and they were bound by string tied in a printer’s knot that I assumed (therein was the problem) was at least 50 years old. I imagined the two-color effect would be created with red ink and perhaps a gold or brown. When I received the engravings, they were beautiful, but I sensed something was wrong. I proofed them in black and in position, but the image that emerged was incomplete. The reindeer appeared to be only skeletons. Santa was missing his hands and most of his face, and the presents appeared to be out-of-register apparitions from a Tim Burton film. Clearly I am missing one or more engravings to form the various missing colors. The two engravings that I have look okay on a shelf, but they will never form the illustration for the premium Christmas card I had planned on printing. NOTE: Post edited to reflect a correction from Typenut. 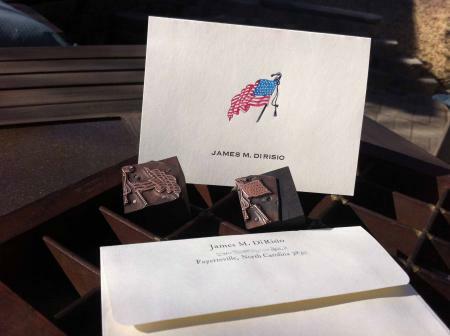 My flag is produced from a red and blue copper stereotype, not from brass engravings. I too have had numerous ATF ornaments that don’t show up in any of their normal catalogs and Dave has helped me ID them over the years. I now have ,over time, managed to find a lot of the supplemental booklets that ATF issued in the 1920’s and 1930’s so I can find many of these things by myself. Your combination cut was first shown in such a booklet issued in 1926. The four pieces in your size cost $3.75. There was also a larger set that sold for $5.00. That was pretty good money in those days. The two specific Holiday Decorations booklets that I have from ATF are the one dated 1926 and the other one is dated 1927-1928. Most of the other booklets are related to borders and ornaments or are showing updated or newly-released type faces from the period. Thank you all for your kind replies — especially Dave for uploading the catalog pages. I am sad that I’m missing a cut — the most important one, at that. I was wondering how that moon, which would be a light color, would show up on light-colored paper. I was thinking of printing it in silver on a dusk-colored paper, but now I see that — missing all the detail — my little town would be completely blanketed in dusk-colored snow. The blizzard of ‘32! If you ask him nicely, maybe Dave can make a proof for you of the element that you are missing. You could then have it made up by a photoengraver. You’d have to work a little harder with the registration, but it beats not being able to use it! 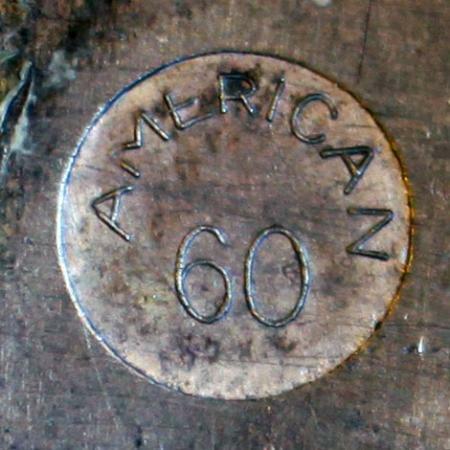 Would it be possible to post a photograph of that “AMERICAN 60” pinmark? I have not seen it illustrated before. Dan, I’m actually thinking of rolling with the “Blizzard of ‘32” idea. As we who work with metal type know so well, limitation spawns creativity. David M., here is the pin mark. The 60 must refer to the point size of the cut, which is exactly 60 The length of the cut is an odd size — 202 points. Thanks. That’s interesting. It indicates that your ornaments were cast on a pivotal type caster, not a Barth (which does not produce a pinmark). It’s also useful to see this illustration because this pinmark isn’t shown in the published sources of which I’m aware (Lasko, Harnish, flickr). E-mail your snail-mail address to me and I will send you a proof of the missing block. It might take a bit of work to get an engraving to register, but I have done it before. 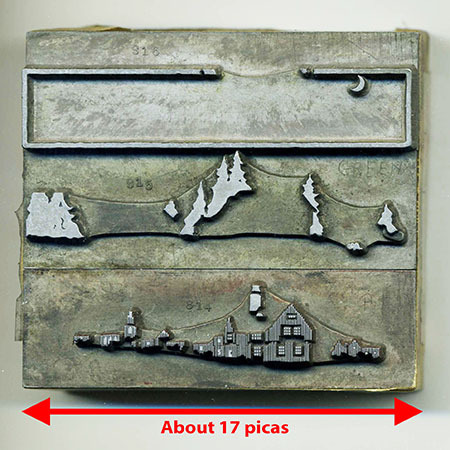 Since it is the last block to be printed, it is easier than having the color blocks missing. ATF had a pivotal caster called the Adcut which was very good for these larger castings produced in smaller runs. Greg Walters in Piqua, Ohio owns this machine and recently ran some of the Cloister Initials on it. state that ATF had a ADCUT Pantograph to cut large Mats. But not to cast them.